The Karlsson/Bergman family with the first Hypro processor. From the left: Tommy, Elisabeth and Linus. Today the processor is found in 32 countries and its most important sales channel has been Elmia Wood. 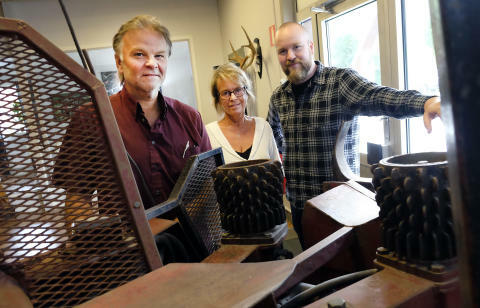 After an accident in the forest, Tommy Karlsson had the time to create something that would reduce the risk of future accidents: a hydraulic processor for tractors. Now known as Hypro, the product is available in 32 countries. Karlsson developed the tractor processor for his own needs and it was finished by 1984. 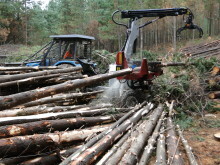 The company that supplied the hydraulics felt the result was so professional that it should be exhibited at a forestry fair. An expert was brought in to assess the functioning and market potential. “He said the market was basically saturated and told me that I could sell maybe a dozen of my processors locally,” Tommy remembers. In 1987 he and his wife, Elisabeth, exhibited the only example of the processor at Elmia Wood. By then the product and company had gained a name: Hypro. Many people were interested and the forest owners at the fair saw what the expert had missed. Competing processors were mechanical but this one was hydraulic and therefore lighter and easier to manoeuvre. 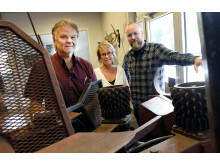 “We sold the first processor at the fair but in the weeks after we got home, 15 prospective customers visited us for a demonstration and 14 made a purchase,” Elisabeth says. However, only one processor existed – the prototype. 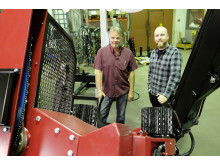 With the help of suppliers, the customers got their machines but the orders kept pouring in. 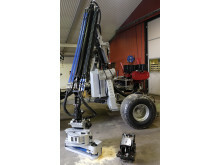 The next export boost came in the mid-1990s, also at Elmia Wood. Into Hypro’s stand stepped a Portuguese man, who suggested that the Swedish company should send a processor to Portugal for demonstrations in a eucalyptus plantation. Tommy went along as the operator. That success in Portugal opened the door to Latin America. Chile is a growing market and Tommy has been there a number of times. On one occasion he visited a village far out in the countryside. “They only knew three things about Sweden. Our country is on the other side of the world, Elmia Wood and Hypro,” Tommy says. 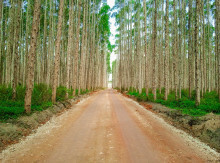 The export route has continued to go via Elmia Wood. Forestry professionals come here from around the world, and using the fair as a starting point, Hypro is supplying more and more countries. They now number 32 and stretch from Thailand to Canada. 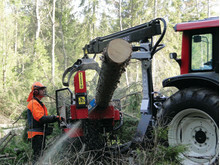 Many diverse types of wood are handled with the Hypro processor. In addition to the various Nordic coniferous species, the most common are eucalyptus, acacia, Monterey pine and Douglas fir. Hypro still has its head office in Lönsboda, Skåne and its Swedish customers remain important. The product range has expanded to include five processes in varying sizes, with or without a crane, energy-wood felling grapple, felling grapple and forwarder trailer. The company has a number of suppliers but all the products go through Lönsboda for inspection and testing. Because everything must work properly and last a long time. “We sell machines, not spare parts,” explains the next generation of the Karlsson family, son Linus, who has joined the company together with his brother Daniel. Hypro has exhibited at all editions of Elmia Wood since 1987 and will be there again on 7–10 June 2017. Or, to be more accurate, will most particularly be there then. Because in 2017 Hypro is celebrating its 30th anniversary. 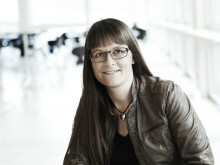 Prior to publication, it must be approved by Elmia AB. 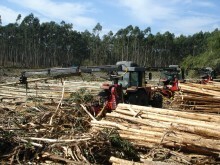 Forestry is one of the most important industries in Brazil and trees there have a very high growth rate. But a changing climate including drought can lead to the reduced growth of such species as cultivated eucalyptus and pine. At this year’s Elmia Wood on 7 to 10 June the unmanned aerial vehicles will have their own separate section called the Drone Zone. The fair is collaborating with UAS Forum Sweden, which arranges Sweden’s leading conference in the field, and which is assembling experts and suppliers for the fair. Four months before Elmia Wood opens, the organisers confirm it will be the world’s biggest forestry fair ever. “By January we’d already sold more stand space than at the previous Elmia Wood in 2013,” says Exhibition Manager Jakob Hirsmark. The German truck manufacturer MAN sees Europe’s forestry sector as an increasingly important market. That’s why the company is exhibiting at the world-leading forestry fair Elmia Wood 2017 in the new Load & Transport area, which brings together everything to do with logistics en route from the forest to the industrial consumers. For anyone who wants to experience steel nerves, quick decisions and powerful machines, one hot tip is the stand of the Swedish Association of Forestry Contractors at Elmia Wood. “During the fair we’re holding the Swedish School Forwarder Championships, the Swedish Forwarder Championships and the Forwarder World Cup. There’s going to be a lot of action!” promises Karl-Magnus Hembjer. Bratteborg, thirty kilometres south from Jönköping.